When creating a comfortable space to sit and relax, tables and end tables are often an afterthought. Once we have fit our sofas and chairs into a room, it’s time to start adding those extra pieces of furniture that tie it all together. Here are a few DIY coffee table ideas to incorporate a little “vintage chic” into your decor. This slotted table is perfect for moving about the room where you need it. 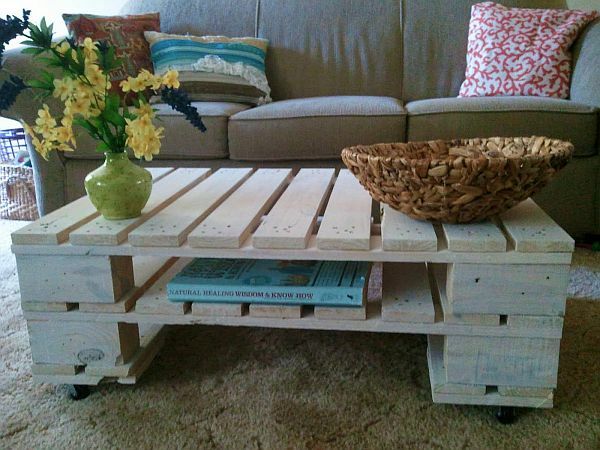 A few boards with criss-cross ends are mounted on a larger sized wheel that bring a rustic feel to this coffee table. Like a puzzle, these crates fit together for an adorable square coffee table that boasts enough little nooks and crannies to store anything you might need once seated comfortable on your sofa. Looking for a creative way to mount a glass-top table? These stacked books are a great way to bring a shabby chic feel to your decor. Some other ideas are vintage toys, statues, or anything you can level. Use your imagination!